A view from the cycle path: Has Britain progressed in the last six years ? Thanks for this thought-provoking post. I live near Weston-Super-Mare (in Backwell) and agree with your comments about cycling provision in Weston, which can also be said for the rest of North Somerset. The County Council have some very good cycling officers who get it, but are thwarted by Council leaders who - notoriously in the case of the "Elf-King" - prefer to spend money on Bikeability rather than infrastructure. I & a number of others are trying to change that, but we are swimming against a strong car-centric tide. We will continue to do what we can, however. Coming out of Dover there is an alternate route that you can cycle, however it's confusing and isn't well signed for getting between the docks and the train station and needless to say is rather indirect. It's my dearest wish to get through traffic removed from town centres. However if anything like this is ever mentioned legions of shopkeepers start moaning about how it would be the end of civilization as we know it. Of course, through traffic is just that - people who aren't stopping to shop, and are trying to get through as fast as possible, making life thoroughly unpleasant for everyone else. My nearest town of Cupar, in Fife, has just started 9 months of roadworks (voted for by our local "sustainable transport"-friendly councillor), the aim of which is to INCREASE the volume and speeds of traffic passing right through the town, as well as moving a historical monument to make it easier for lorries to make fast sweeping turns around the narrow shopping streets. 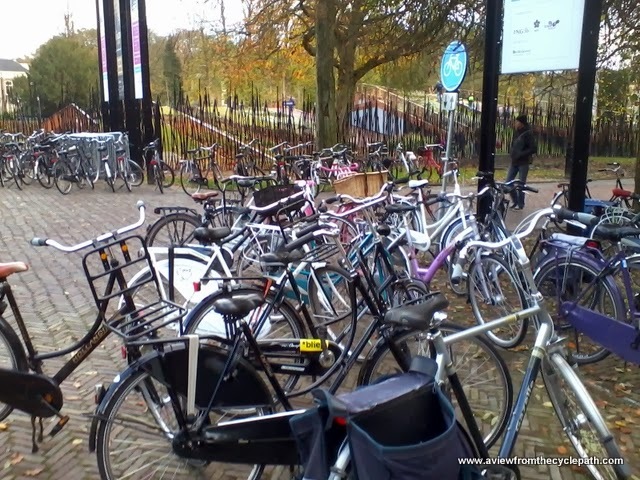 Oh, and to do this they have to take away all the cycle parking. Of course it doesn't really matter, because I can't even get to this town by bike from a village 5 miles away. I have a choice of 2 A-roads (one on which a cyclist was killed a few months ago). Or there's a muddy track generously 6 inches wide in places. This is designated as a "Millennium cycleway", (I guess it's not from the latest millennium). 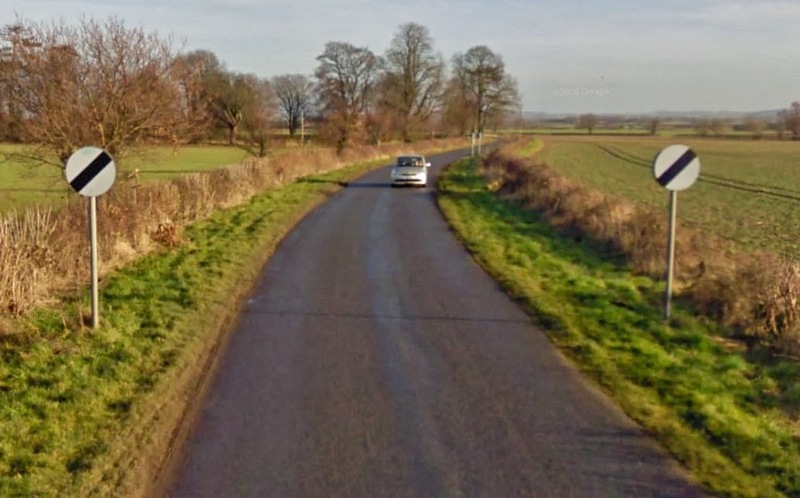 It would actually be easier and safer for me to cycle 2 miles in the opposite direction on quiet country lanes, then get the train 7 miles into town. Yesterday it was in the news that Fife council is one of the "top cycling providers" in Scotland. The reason Cat's Eyes aren't used much in NL is because of complaints by motorcycle riders, I believe. It seems for a motorcycle, even the small bumps of our polymer dashed lines (about 3mm) can be a problem. But I agree, those cat's eyes help, but perhaps also in raising the average car speed? Of course, the Netherlands has sorted out short distance journeys because of its cycling policy, meaning much reduced car congestion in towns compared to the UK. However, the attitude for longer distance journeys appears to be similar to the UK in terms of catering for increased car travel. Road building in the Netherlands is proceeding at a very fast pace at the moment, much more so than the UK. The Dutch don't seem to believe that building roads encourages more use of cars. If trip length increases as a result of road building, maybe that may impact negatively on cycling as short cycle trips get replaced by long car trips. The energy picture for the UK is bad and getting worse. They've run through their North Sea spoils and are now importing large quantities of both oil and natural gas. Consumption of both fossil fuels is on the decline in the UK, though not as fast as the decline in production. But even with oil consumption on the decline since 2007, new car purchases in the UK have been rising the past few years. It is very curious. The Dutch use relatively little oil in daily life but their total per capita oil consumption is relatively high. This is because of the large oil refineries in the Netherlands that end up using oil products as energy in the refining process. Belgium and the Netherlands provide a large portion of the oil products consumed in Europe. In the Netherlands case, it's a little like a drug pusher smart enough not to use the drugs he sells. I think in the end the Dutch are going to have to wrestle with this, especially as sea level rise causes them billions of dollars a year to continually re-engineer their defenses against it. I live in the US, a country that is making small inroads in improving bicycling conditions but that also squanders energy prolifically and is far more environmentally destructive than even the worst European country in almost every imaginable way. As far as motor vehicle speeds go, my understanding that most cars reach peak high speed efficiency at about 90 to 100km/h (in 5th gear at about 2500-3000 rpms). If this is true, then it would follow that in most countries motorways would have less of an advantage then they do now compared to rural or secondary roads. This might be horrible for the rural situation unless it is countered my more people taking trains or buses. But more likely this 20-30km/h differential cannot be adjusted for, as it were, with public transport. Sorry, to clarify my earlier comment: I was describing an alternative but sensible reality where the speed limit on motorways is 100 km/h. My wife proposed going to the UK for our summer holidays next year. Would be good to practise some English for our children, she said. I suspected her of being influenced by "All Creatures Great and Small" ;-) but I was tempted as well. In the end, thinking about our children, we became aware of that we wont be able to go by bike confidently. Instead we will go to the Netherlands and Belgium. There are some articles with interesting comments in the Guardian today about the most recent cyclist death in London. Well, what I see in my North Hampshire town is the cycling infrastructure improving and I can get about anywhere within it (save for the pedestrian only shopping centre) by bike on the wide cycle/footpaths which have increased considerably over the past few years. It’s part of the Sustrans route 23. Someone said the other day, it was around 5900 miles of cyclepaths – don’t know how true this is. I see similar in towns up to 25 miles away from my own (I don’t go further by bike). I’ve found it quite doable by cyclepath and b-road. I have two bikes: a Gazelle Toer Populaire weighing 22.5kg and a Kettler Spirit which must weigh close to 20kg with it’s 2 baskets. I’ll accept that it doesn’t compare with the Netherlands; but, does any other country? I understand Copenhagen is very cycling orientated, but that it’s nowhere near Amsterdam, cycling infrastructure-wise. Ironically, it seems that to improve conditions for cyclists we are going to have to do some road building. I note that Assen has both a ring road (partially dualled) and a bypass (something you have alluded to as a measure used for other towns in the Netherlands). 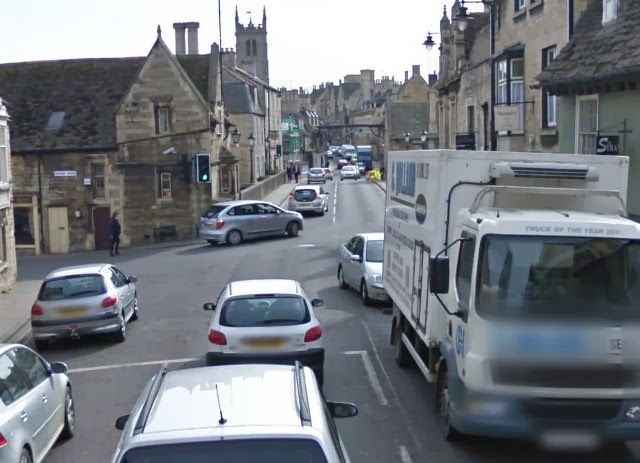 Although I live nowhere near Stamford, I think I can speak for their residents and the residents of a hundred other small towns and villages in the UK when I say they are probably begging for a bypass, for something to take away the traffic from the centre of their town and make it a more pleasant place to be. 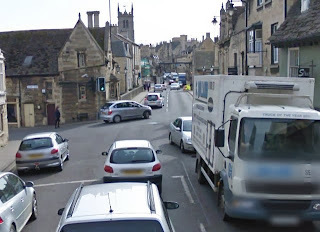 That we increase capacity on those roads which go through the town (and towns like it) is not a symptom of the UK's car-centricity it is that we do not have the money to bypass, nor, given the Byzantine planning process do we apparently have the political will to do so. Also, the reason that the rural 'A' roads are so well used is that the big plan for a proper motorway and trunk road network, as envisioned in the forties and fifties was still-born. What we are left with is a partial trunk system supported by a myriad of what were essentially cart tracks, made up over time in order to carry motor vehicles; again, no overall plan, just a lash-up that has become set in bitmac. Andrew, you're quite right. Some road building is needed. I know there are hundreds of towns which are blighted by constant traffic and I'm sure their residents would all like to see the traffic disappear. Bear in mind, though, that not all Dutch towns have bypasses (Assen has a partial bypass) and not all British towns don't have them. Nevertheless, British towns are all uniformly worse for cycling than Dutch towns. Why don't bypasses work in the UK ? Well one problem is that British bypasses often aren't really bypasses at all, but just extra routes. The route through town generally remains as a perfectly viable option. What happens then is that capacity is increased overall and therefore more motor vehicles can be accommodated, inducing more demand. Dutch bypasses really do bypass, leaving the old road relatively car free. The first streets featured in this video were once the busiest in Assen, for instance, and in the 1960s and early 1970s they looked not dis-similar to Stamford now. In case it did come over a little 'car-centric' I should say I'm all for transforming the UK into something approaching the Netherlands. Unfortunately, a great deal of the commentators/activists on cycling appear to be from London and truly seem to have no concept of how the rest of Britain functions. It might not be nice to admit it, but for those of us without the Tube, who have to cope with the joys of fully deregulated buses, slamming the car does nothing; it is, and will be, a necessity for the forseeable future. What we can do is try to make that foreseeable future much shorter. Andrew, it didn't come across that way to me. I've often pointed out that while the Netherlands is the most successful country for cycling, this has not been achieved by anti-car policies. Similarly, other countries, like the UK, could achieve a far higher cycling modal share than they have now without anyone having to antagonise motorists. Actually, cycling campaigners shouldn't be alienating today's drivers. These people drive now, but should be considered to be potential cyclists in the future, given sufficient infrastructural change that cycling became sufficiently convenient and safe for them. These are people who could be on "our" side in in the future. What's more, even those who continued to drive would find that traffic jams were shorter if more people cycled. Everyone wins from better designed infrastructure.